Get in the car! Get in the car NOW! It was on the last drive back from a weekend road trip. There were three of us and for a girl who drives thousands of miles alone, I was soaking it in. It was late and there had been only miles Canadian bush for the last long while as we talked, and the darkness pushed in on the headlights. Suddenly the temperature gauge shot up to red and we pulled up along the narrow shoulder, me inwardly groaning at yet another car problem. Because of previous vehicle issues that trip, I knew that we needed to wait until the car cooled down enough that I could add coolant to the radiator, since for various reasons too complicated for here, it was disappearing rather unnaturally. So we waited in the dark, Teresa, Paula and I, with our red emergency lights flashing slow across the empty road. We talked and talked and it wasn’t anything about the newest trend in skirts. I know I’ll always remember sitting in the inky darkness, feeling my eyes mist, realizing how deep our stories run. One semi roared past and that was all, besides the empty asphalt and inky pines. After about 30 minutes I though the engine was probably cool enough and grabbed my jug of antifreeze. The weeds were high alongside the ditch and everything was silence and very black. “I’m going to get out. I’m going to face my fear” Paula said, opening the door and coming out with me. Her voice was as determined as it was brave and I was so thankful for someone standing beside me. I leaned under the hood, fiddling with the radiator cap, folding up a sweater around it so it wouldn’t scald me if the pressure was still high. My back was turned from the road, as I pulled this and wiggled that. Paula stood in the headlights, watching me. The breeze was cool on my hands and softly rustled the brush in the ditch below. I was just about to open the cap, leaning far to one side in case it shot hot liquid, when Paula’s voice shouted fear. She pointed through the slit bellow the raised hood. 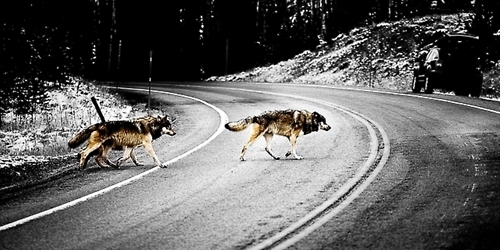 There, on the road, behind where we had just been standing, were three wolves. They had slipped up without a sound and stood there, eyes glinting in the darkness. I’ve never seen wolves in the wild. I never care to see them that close again. Even now, I get shivers just writing it. Finally, after staring us down, they slunk off and we, still shaken, tried to decide what to do. The car was still out of coolant, the hood was still up, and the jug of antifreeze was still sitting where I left it. It was very very very scary. I for one, was very glad Paula warrior-faced the darkness and saved my rear end from getting chomped on. YIKES!!!!! I’m certainly thankful you’re still alive, dearie. :O Someday you really need to write a book about all your experiences – I’d definitely buy it!! 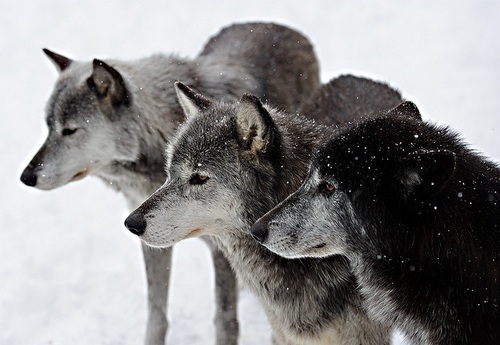 First bull Moos, and now wolves… What next? Dragons? I would love to meet a dragon! OH MY, OH Dear – what else is there to say but I’m thankful God spared you from real tragedy. Obviously you somehow got the coolant in or drove without?